Firstly, apologies for the silence across the board. I’m just going through stuff right now that I would probably talk about some day, but today isn’t the day. Instead, I’m going to slip into the familiar, like a pair of soft, old, PJs and muse about a subject dear to my heart – sunscreen. And the sunscreen of choice is Dr. Jart+ Every Sun Day UV Sunscreen. To be honest, I’d never have thought to try this one, simply because I’m a bit of a stickler when it comes to sunscreen. I like using what works, because what doesn’t work can screw things up something awful for me. 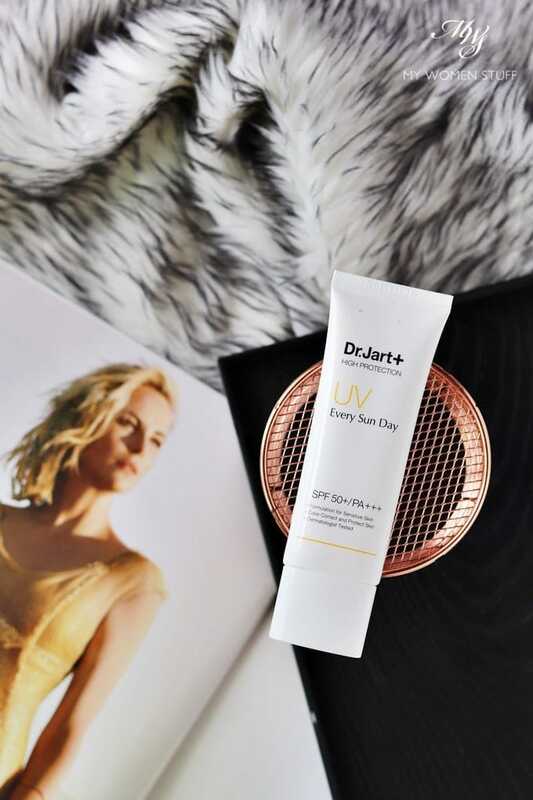 But this reader shared with me this Dr. Jart+ Every Sun Day UV Sunscreen because it was one she enjoyed using and she wanted me to try it for myself. I eventually did a few months ago! Dr. Jart+ is a brand from Korea but I believe it was one of the earlier brands to make an impact in the Western world. Their ceramidin range comes very highly raved but it’s a brand that I don’t have a lot of experience with. This is only about the 2nd or 3rd product I’ve tried. The popular Ceramidin liquid broke me out so I gave it to a friend. But there are some things I like very much about this sunscreen. For one, I like the texture very much. The other thing I like is that it comes in a slim tube. It is compact and portable so it’s easy to slip into your bag or travel pouch and tote it about. The third thing I like is the slight pinky-beige tint that you can see in the swatch above. This slight tint gives skin a bit of brightening effect which is nice, if you don’t feel like wearing makeup that day. Or perhaps you can use it as a base for your makeup as well. 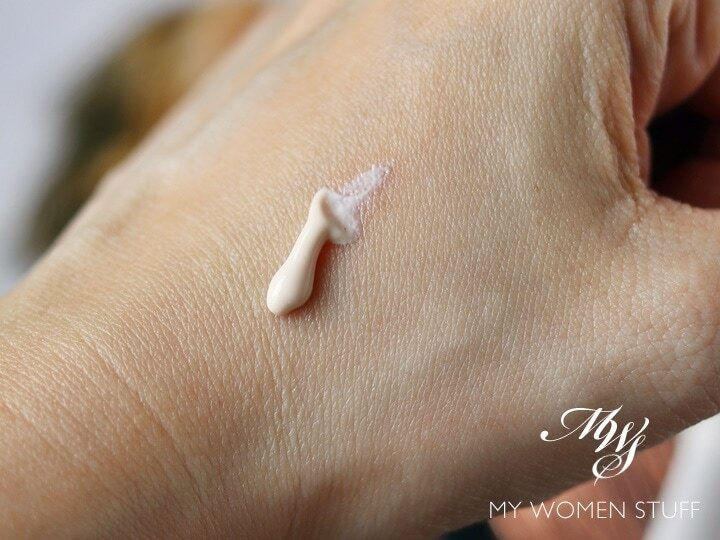 However, this is NOT a tinted foundation. I slather on quite a bit on my face and it offers no coverage, just a hint of more lifted complexion. However, if you have a deeper skintone, this tint probably isn’t as flattering on you as it will be on someone with a lighter skin tone. Considering that it is a Korean brand, I’m not too surprised at their lack of diversity in colours as skin tone ranges in Korea is pretty limited. I also like that the Dr. Jart+ Every Sun Day UV Sunscreen comes with broad spectrum SPF50+/PA+++ protection. It uses both chemical and mineral UV blockers, and in fact, lists Zinc Oxide as its primary blocker. A whopping 12.66% Zinc Oxide! I was a little worried at first because my skin does not like high concentrations of zinc oxide, even if it is a highly rated UVA and UVB blocker. But having used it for a few months, I can safely say that it has not broken me out. This might be the reason that there is a tint to the product. It reduces the white cast that Zinc Oxide and Titanium Dioxide leaves on skin. But do I like it as an everyday sunscreen? This is where I am a little bit on the fence. The product as a whole appeals to me. But I found my skin heating up a little when I wear this outside on hot sunny days, and that did not sit well with me. Also, because I have to deal with hyperpigmentation, I do pay a little more attention to the dark spots and despite all the UVA and UVB blockers this sunscreen has, I still find the odd spot darkening after a prolonged stint in the sun. Seeing as I live in the tropics, the sun is really my worst enemy and while I’m not doing much about my dark spots, I am trying to keep them under control. This does not seem to do it. Also, because of the tint, it can feel a little off putting topping up sunscreen throughout the day when you’re out as the “brightening effect” may be too pronounced. So, I like this, but I wear it on days when I have to be indoors or when I wear makeup because it makes a good makeup base. But it isn’t my first choice to take on a beach holiday. 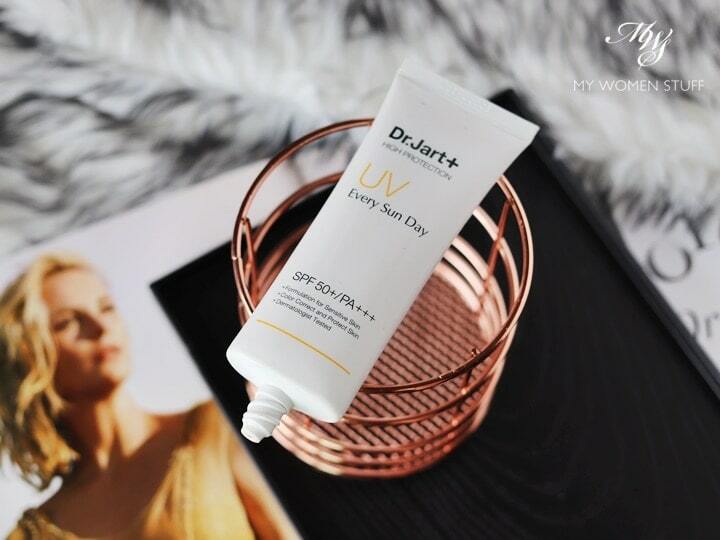 The Dr. Jart+ Every Sun Day UV Sunscreen is a broad spectrum SPF50/PA+++ sunscreen that boasts protection from UVA and UVB rays. The texture is quite creamy which is very nice for someone with drier skin, but may feel a little heavy on oily-combination skin types. So don’t get this one if you have oilier skin because you will use too little product for it to be useful. There is also a pink-beige tint that brightens skin somewhat. Nice, but too much product will result in it looking a little too obvious. Also, it might make deeper skin tones look ashy. This boasts both mineral and chemical UV blockers, with Zinc Oxide being its primary UV ingredient, which is great because it does a good job of blocking both UVA and UVB rays and is fairly inert. I however don’t find it protects my skin well enough against the heat and I do detect some spots getting a little darker while using this. It’s a good indoor sunscreen but not one you’d be taking to the beach. 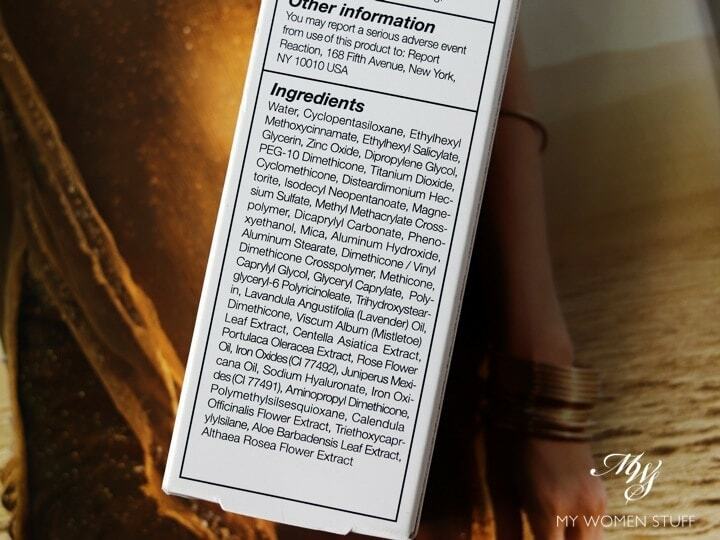 Here are the ingredients for the Dr. Jart+ Every Sun Day UV Sunscreen. Thank you Liz for sharing one of your favourite sunscreens with me! Have you tried this Dr. Jart+ Every Sun Day sunscreen? You know what? I don’t know where to buy this in Malaysia! I can’t find any information on it, and none of the usual suspects sell it. So, if you have seen this or know where to buy it or love it (or hate it!) please do let us know in the comments! Your beloved shiseido sunscreen has new formulation in perfect uv range. It’s called multidefense perfect uv kot. Have u tried it? Hi Mai, I have been told as much too! But I haven’t tried it yet unfortunately. Working through quite a lot of sunscreens at the moment, so I haven’t thought to buy the new one yet 😀 Have you tried it? Sorry to interfere..but i had tried the new formula, its not the sameee..? ?..there is no pinkish tone anymore and also its feel much drier than the previous one..at least that what i saw and feel first hand..I feel so upset cause thats the only sunscreen i had wear that does not break out on me.. I have a new sunscreen favorite. Pretty expensive, but great texture, and my hyperpigmentation has improved so much (always using a full teaspoon for face (the majority of the amount) and neck). It’s Prevage by Elizabeth Arden. Hey Maja, you have me thoroughly intrigued! I shall have to look up more on the Prevage sunscreen (I’m not sure if we get it here and if we do, if I’d need to sell a kidney for it! LOL! 😀 ) Thanks for the rec – the improvement of your hyperpigmentation is what’s selling me! Please let me know if you tried it. I think I may have been using too little sunscreen before, but I actually think that in the last two months my hyper pigmentation has improved more than in the last year or so. Interesting point about correlation between tinted sunscreen and the amount used. I’ve seen this brand around but honestly didn’t think it was a brand from Korea. Sounded like a western brand to me. Nice read. Yep it’s been around the western world so long. I remember it primarily for Ceramidin that many people love.